Cost analysis studies have resulted in a 70% – 80% cost-savings for our clients. Even a small research study can save thousands of dollars by using our patented sample transport mediums. No concerns with continuous cold-chain storage from sample collection to arrival at laboratory. AssayAssure® does not cause damage associated with the freeze-thaw cycle, unlike dry ice. Usually dry ice shipments must be received within 48 hours of collection and packing. AssayAssure extends this sample receipt window 4 to 10+ days after collection. AssayAssure® is ideal for remote research situations, or when logistics prevent quick access to dry ice and airports to ship samples. 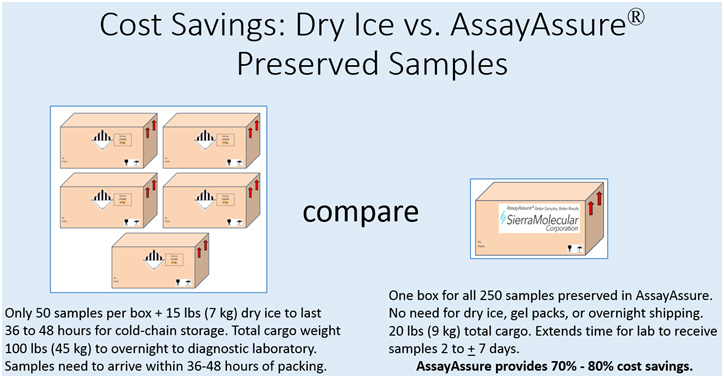 Without the added weight and space taken up by dry ice and packaging, hundreds of samples preserved in AssayAssure can be shipped in one box. National and international overnight shipments are not necessary, thus greatly reducing freight costs.